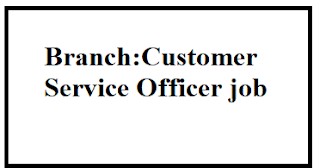 Customer Service Representative - CSO is one of the key positions in the Branch Operations team. A CSO is primarily responsible for the timely processing of banking transactions such as money transfers, checks, account opening, reconciliation of office accounts, timely resolution of customer inquiries and improvement of customer service levels. A CSO is responsible for the lead generation of checking accounts and savings accounts - CASA for new customers and the deepening of account balances for existing customers. The CSO makes outbound marketing calls and scouts for new leads and referrals to generate business. He / she ensures that the Bank's rules are adhered to - internal policies, processes and procedures. He / she is responsible for improving the internal audit of the industry's operational efficiency by continuously completing the assigned tasks. He / she is involved in protecting the Bank's property in accordance with safety standards and ensuring ethical conduct in the ordinary course of business. A CSO is also responsible for cross-selling third-party products (life insurance - LI, General Insurance - GI, mutual funds - MF, debit / credit cards, etc.). to the existing customer base. An FDO also has internal certifications in the areas of knowledge improvement about banking products, finacle system, processes and regulatory standards such as Know Your Customer, Anti-Money Laundering - AML etc. He / she should be open-minded when dealing with a job transferable Nature.